GRAITEC announces the compliancy of Advance Steel andAdvance Concrete with AutoCAD® 2012 and AutoCAD Architecture® 2012. 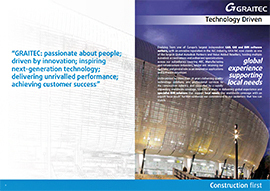 Advance Steel and Advance Concrete are part of the GRAITEC structural BIM solution, and have been developed for design offices, building industries, steel and concrete detailers. Advance Steel is specifically designed for structural engineers and steel detailers who require a professional and easy-to-use BIM structural steel detailing software that automates the creation of workshop drawings, general arrangement drawings, BOMs and NC files. Advance Concrete is specifically designed for structural engineers and reinforced concrete detailers who require professional and easy-to-use BIM software that automates the production of formworks and reinforcement drawings, BOMs and NC files. AutoCAD® 2012 enables the quick creation of documents from a variety of modeling formats, helping to reduce manual documentation workarounds. Capture and import as-built information to jump-start your design process. Plus, you’ll find a wide range of timesaving enhancements to the features you use most. AutoCAD® 2012 delivers the powerful tools you need to participate in smooth 3D design workflows, helping drive your projects to completion more quickly than ever before. With new and expanded workflows for 3D conceptual design, model documentation, and reality capture, AutoCAD® 2012 helps design professionals maximize productivity.